You can transform your Tweets so that they stand out, get attention and get shared. Below is the tried-and-true method of top advertising agencies that you can use to make your Twitter messages stand out. Plus the one Twitter rule to follow to make sure you’re engaging your followers. The Golden Twitter Rule: DON’T OVER-PROMOTE. Twitter, like all social media, is based on exchange and reciprocity. For it to work well, it should involv e giving and taking. Instead of going to Twitter only when you have something to sell, see if you can also contribute…useful articles, graphics, re-tweets or amusing lines that have nothing to do with marketing. There is a fine line between being proactively promotional and annoying. Studies of “optimal” numbers of Tweets per day put the number at 5. After 5 tweets, engagement drops off. If you’re Tweeting 5 times a day, only 3 of them should be promotional. Now that you know the rule, it’s even more important to make those 3 promotional Tweets a day count. AIDA is an acronym that has been around the advertising world for decades. It stands for ATTENTION, INTEREST, DESIRE, ACTION, describing the ideal sequence of events a potential customer goes through when seeing an ad. Promotional tweets are, in essence, 140 character advertisements, and good ones use the same formula. ATTENTION and INTEREST should go hand in hand because, let’s face it, it’s fairly easy to get someone’s attention, but that alone is not enough. Transforming momentary attention into sustained interest is what will lead to someone engaging with what you’ve got to say. 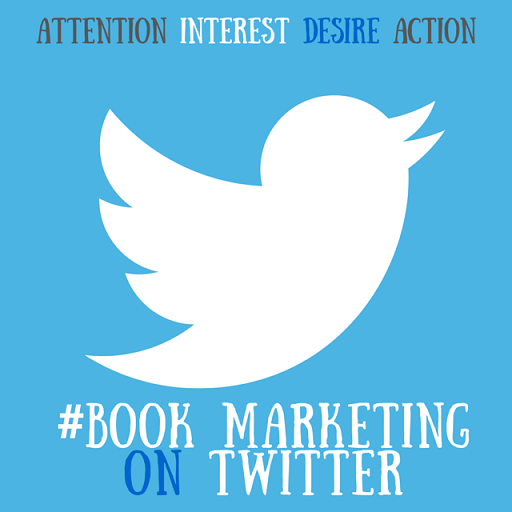 Attention and interest can be sustained by the use of what is called a “hook.” Start your Tweet with something that attracts attention and makes the reader want to know more. Starting a Tweet with “Read My Book” or “My New Book” neither attracts attention nor generates much reader interest, unless the reader is your mother. But “How I Sold 100,000 Widgets in 4 Weeks” for a book on marketing or “7 Billion People in the World & None of Them Are Dating You” for a book on dating get attention and maintain interest. DESIRE and ACTION are also linked, in that creating desire should result in action. In the case of a Tweet, the action you’re after is a click on the link or a re-tweet. Creating desire is an art, but it should always begin with knowing your audience. Who is the tweet intended for? Romance novel readers? Then begin by answering the question “Why do people read romance novels?” For diversion? To be swept into another world that is very different from their own? Once you understand your audience, you can begin to craft a message that responds to their desires. The Volkswagen Beetle advertisements of the 1960s, created by Doyle Dane Bernbach (DDB), are some of the most iconic ads in history and are examples of how AIDA works. The spare photo and simple, unexpected headlines attract attention and interest, while the copy that describes the rejection of a car by Volkswagen inspectors because of a slightly damaged bumper uses soft sell to communicate quality and create desire. Following these ads in 1960, the Beetle became the best selling car of all time. Though this ad for Truman Capote’s “Other Voices Other Rooms” came before the AIDA era, the pose and youth of the author in the photo, combined with phrases describing Capote as the most important new author of his era immediately attract attention and create interest and desire to learn more about him. A series of print ads for Israeli retailer Steimatzky Books, created by ACW Grey Tel Aviv, uses arresting visuals and humor for immediate attention. Humor is also used to tap into avid readers’ affection for books in general and to create desire. The campaign is an excellent example of knowing your audience (habitual, lifelong readers) and of speaking directly to their desire for books that are so good, they make you stay up all night reading. The ads also promote the societal importance of books and reference the pleasurable reading experiences of the target audience. The phrase “Have you heard?” attracts attention, while the use of “revealed” makes the introduction of a new car sound exciting, creating desire. Author Augusten Burroughs uses Twitter to showcase his humor and personality. These Tweets are not directly promotional, but they use humor and subject matter for attention and interest. The humor also creates desire…in this case, the desire to see if his books are as funny as his Twitter feed. E.T. Carlton is a former advertising copy writer who worked with brands like Kraft, Nestle and Mazda. She is a content marketing consultant who works with companies, individuals and self published authors on crafting promotional messages and strategies. She rarely uses her own Twitter account. Great advice. I’ve been guilty of the ‘buy my book!’ posts before, until I saw others doing it and realized how annoying it is. A “buy my book” Tweet every once in a while is ok…but it won’t get as much attention as one that makes the reader want to know more about the book. The Advertising Trick That Will Get You Noticed On Twitter..Don’t over advertise your goods..
Hi, visiting you via The SITS Girls. I had heard of AIDA before but have never used it, very, very interesting! Thanks for sharing. So glad you liked the post…and try using AIDA. It’s easy once you get the hang of it! Still…he sold more than 250,000 copies in its first year. No data exists on how many copies were stolen.